With sentencing set for February, it's expected that rapper Lil Wayne will be facing a year-long prison term over weapons charges. As a result, he's preparing to be absent for a while, and needs to downsize his illustrious lifestyle. A three-bedroom condo he rents in Miami will soon see the rapper moving out, so the landlords are trying to sell it off. The only problem is that the place reeks of marijuana. According to the New York Post, a possible buyer had a bizarre experience when he went to view the apartment. "My fiancée and I called to make an appointment to see it, and the broker, deadpan, goes, 'I have two questions: Are you offended by the smell of marijuana? And do you mind coming late in the afternoon? It's currently rented by Lil Wayne, and these are not morning people," the unnamed man said. 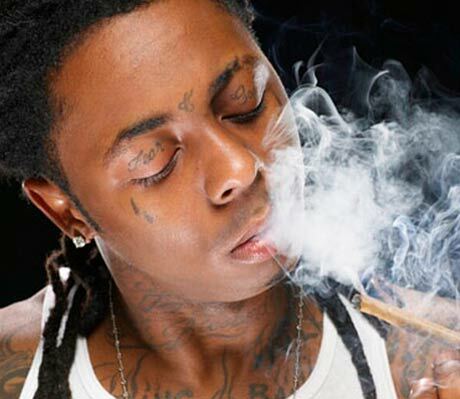 "Once we got there, a member of Wayne's posse opened the door to the overwhelming smell of marijuana," the source continues. "Two hot, rap-video-looking girls were walking around in nothing but a bra and underwear, blasting hip-hop. We just went in and looked around and tried not to stare." It all begs the question, where's MTV Cribs when you really need them?